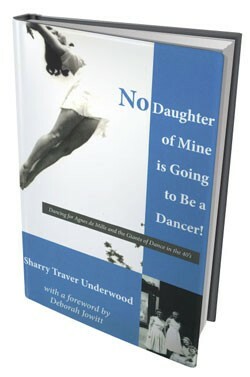 Sharry Underwood didn’t take a formal dance class until she was 20 years old. But she would go on to dance in the ’40s with some of the earliest icons of American modern dance — Ted Shawn, Martha Graham and Agnes de Mille, to name a few. “I knew nothing, so I took notes on everything,” she says of starting out in the nascent modern-dance scene. Those notes, and her diaries, were the starting point for the 90-year-old’s recently published memoir, full of lively stories of her life on stage: No Daughter of Mine is Going to Be a Dancer! Underwood was born in 1922 in Harrisburg, Pa., to a professional baseball player father and an organist mother. In 1927, her parents suffered a car accident in which her mother was thrown through the windshield, her vocal cords severed. From then on, Underwood and her two sisters were told to be quiet when they were inside the house. As a result, Underwood spent much of her early childhood outside. It wasn’t until she left home for Syracuse University that she was able to pursue her dream. Thanks to a family connection to Jacob’s Pillow founder Ted Shawn, Underwood was accepted in 1942 into a three-week program at the brand-new dance school in the Berkshires. Underwood has lived in Vermont since 1952, when she moved to Middebury with her late husband, Wynn. As she talks about her book in her South Burlington apartment one recent afternoon, she raises her arms frequently, as if she were dancing right there at her little kitchen table. She looks younger than her 90 years, neatly dressed in a blue button-down shirt and black pants, her silver hair in a stylish bob. At Jacob’s Pillow that first summer, Underwood met Joseph Pilates, the German-born inventor of the eponymous exercise technique. She arrived early for her first class with him and found the eccentric Pilates standing on his head. “Ach, your back is no good,” he told her. “We fix you, we fix you.” And, says Underwood, he eventually did. Later, after getting her master’s in dance in Texas, Underwood moved to New York City with exactly $100. “I wasn’t afraid. It didn’t occur to me to be afraid,” she says of trying to make it on Broadway. But it wasn’t a smooth ride. Underwood blew her first big audition, for Oklahoma! Desperate for income, she went to the city unemployment office, but couldn’t find any work. Finally, she got a job at a restaurant — but she soon quit to pursue dancing. Underwood never doubted that dream. “It was who I was,” she says. She went a little rogue — started exploring the city on her own and wearing her hair down to dance class. One day, she stopped by the theater where Agnes de Mille was choreographing the Civil War musical Bloomer Girl. They were in the middle of private auditions. Underwood was wearing shorts, an ill-fitting sweater and no tights, but she managed to finagle herself a tryout. She was cast in one of the lead roles. “I just felt like I was in heaven,” she says.